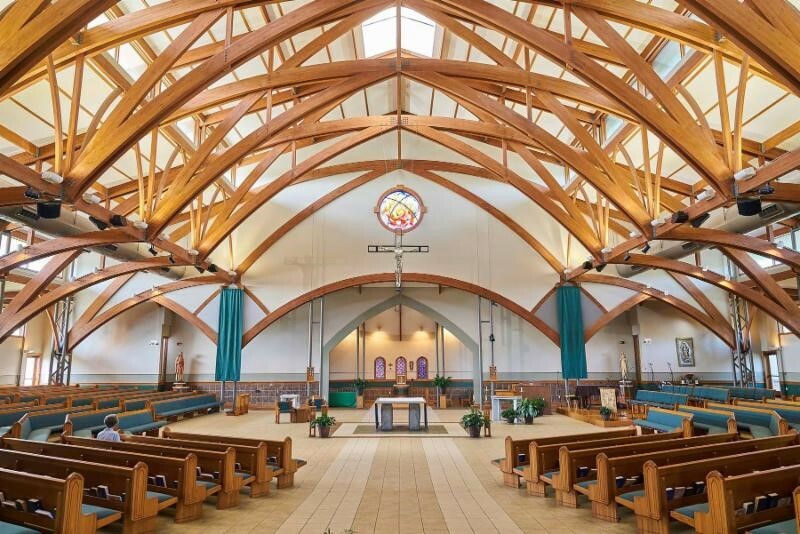 BELTON, MO – Advanced Sound & Communication (ASC) designed and installed an audio system with Fulcrum Acoustic cardioid CCX speakers at Saint Sabina Catholic Church. Founded in 1944 in Belton Missouri as a Catholic parish community, Saint Sabina is committed to providing faith formation for all people. In 2003, the parish dedicated an architecturally unique worship space that enables greater accessibility and versatility to serve their diverse and growing congregation. Following numerous PA upgrades, leading Kansas City AV integrator Advanced Sound & Communication (ASC) was selected to design and install a system to make Saint Sabina Church sound as remarkable as it looks. Consistent coverage and high fidelity were required from compact, full-range speakers with minimal visual impact on church architecture and iconography. Precise pattern control and extended low-frequency control were also essential to keep sound off hard, reverberant surfaces lacking acoustic treatment.